• GIFT CERTIFICATES For LESSONS CLINICS/SESSIONS/CAMPS. 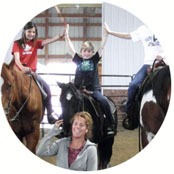 The Ann Cole Training Center is one of Southern Michigan's / Northern Indiana's finest full-service equine training facilities, whose mission is to bring horse and rider together as a team in a slow, step-by-step process with the horse's and rider's best interests in mind at all times. Learn more about our TRAINING & LESSONS. 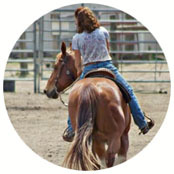 Here at the Ann Cole Training Center, we've been practicing natural horsemanship for more than 30 years. Thinking like the horse and caring for his mind, body, and spirit is where the foundation of our program begins. We buy and sell horses. We also take in trades. We take great pride in the fact that we've been matching horses and riders for decades. 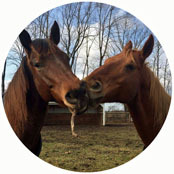 We can help you find the right horse for you. HORSES FOR SALE. 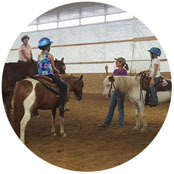 Ann Cole has been teaching horses and riders for more than 40 years. 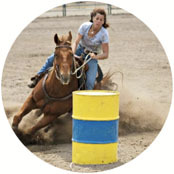 Born and raised in the Michiana area, she has studied and been successful in the disciplines of Barrel Racing, Western Pleasure, Horsemanship, Showmanship, Hunt Seat, and Jumping. She has numerous professional affiliations and is an active competitor as well as TRAINER. The Ann Cole Training Center is a beautiful, brand new Training Facility serving the Michiana area. 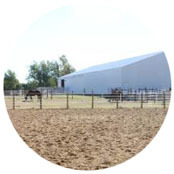 Here you'll find a heated indoor riding arena complete with heated viewing area and restrooms; an outdoor arena; outdoor training areas; boarding opportunities; and more! AROUND THE FARM. Situated along Michigan's southern border, we are conveniently located 2 miles north of Granger, IN, next to Edwardsburg, MI. CONTACT.